Surely your business counts with a Facebook page to provide information to the public. Excellent! Well now, would you like to go a step further and ensure loyalty your clients with a customer service online 24/7? For that, you need a chatbot on Facebook! Here, we will tell you what it is and how you can create one step-by-step. What is it and what is a chatbot on Facebook helpful for? In its eagerness to provide more tools to businesses, Facebook has recently incorporated a new functionality: the possibility to implement chatbots in Messenger to respond frequent questions from the clients and satisfy exact needs. But what exactly is a chatbot? The word chatbot is composed of two parts: “chat,” that means to converse, and “bot,” that comes from a robot. So, a chatbot in Facebook is an artificial intelligence program, capable of “conversing” with people, respond particular questions, and automatically provide suggestions. This way, it is possible to configure it to answer the public, according to the profile and exact needs of each business. 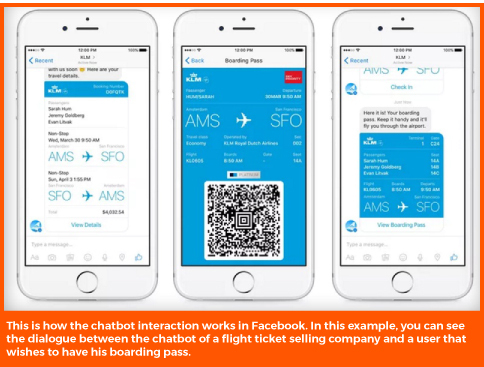 To work, a chatbot in Facebook must integrate with the Messenger chat application, and operate from there. Let’s see the benefits that having your own chatbot can provide to your business. Provide personalized attention to your clients in real-time. Answer their doubts at any time of the day. Add useful functionality to your Fan Page (which represents a great reason to follow you on Facebook). Ensure loyalty with your clients by immediately answering their doubts. Configure programmed questions, according to your different commercial objectives. Offer basic attention without the need to pay a person to fulfill that role. Catch doubtful clients by providing the answer they need at the right moment. To obtain the maximum benefit of a chatbot in Facebook, it is fundamental that you determine what its primary objective will be. That way, for example, it can help you answer technical questions about your products or location, or you can configure it to promote an offer or link, amongst other possibilities. How does a chatbot in Facebook work? Now that you know its uses let’s see how a chatbot in Facebook works. 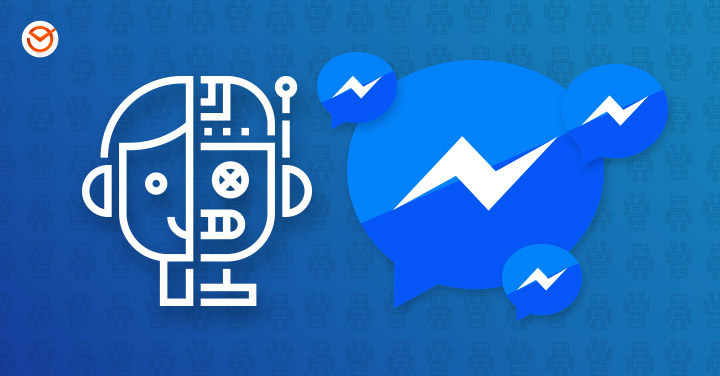 Through the Facebook Messenger’s API (Application Programming Interface), the chatbots can interact with people through texts, videos, images and buttons of call-to-action. For example, a chatbot can help a user to reserve a turn, acquire a product, or realize an online request, amongst other possibilities. 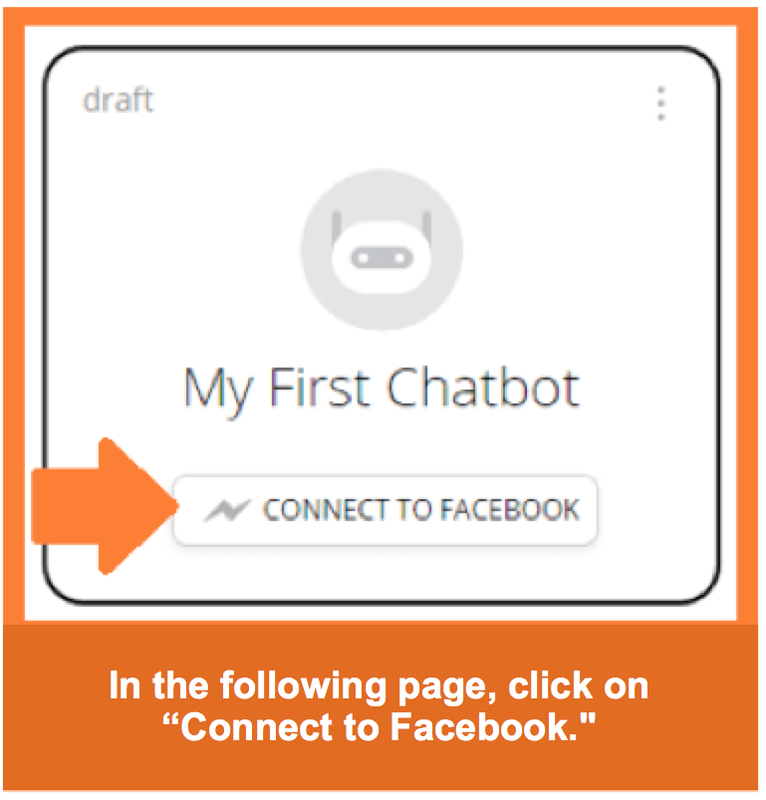 To begin the interaction with your chatbot, people must simply click the Facebook Messenger button available on your Fan Page. Upon clicking the “Message” button (“Message,” in the image below), the users see a chat window appear with a greeting or presentation of options, between which they can choose to obtain an answer according to their needs and start the dialogue. For that, they need to press the “Get Started” button. Once they press “Get Started,” a series of keywords guide the customers through various procedures parting from the interaction, everything which saves them time and discards unnecessary options that do not lead to the satisfaction of their needs. 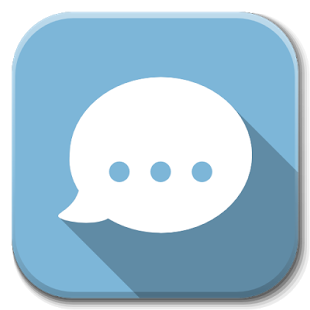 During the dialogue, the chatbot uses keywords that the users write in the line of chat and interpret which of them they could be looking for. For example, if you own a shoe store and the users write the term “Adidas,” you can configure the chatbot so that the answer includes offers with that word. How can you create a chatbot on Facebook? Step-by-step guideSummarizing, you can create a chatbot in Facebook whose artificial intelligence include keywords and predefined answers that you specify. 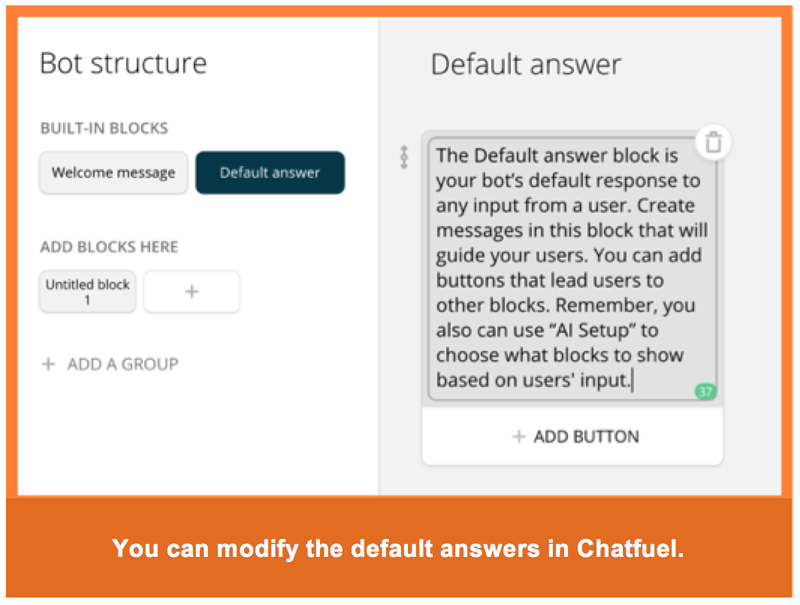 This way, the “bot” can respond with fragments of text pre-written by you that get the user the precise answers. Now that you have the theory let’s learn step-by-step how you can create a Facebook chatbot. To start, you need tools like Botsify, or Chatfuel, through which you can generate your own chat robot without the need to know anything about programming. Next, we will tell you how to create your own chatbot on Facebook free with the help of Chatfuel. This way, you will be able to generate a chat robot based on the menu system predesigned by you. This way, the users will see the options they can click, which will guide them through the menu that you have created. 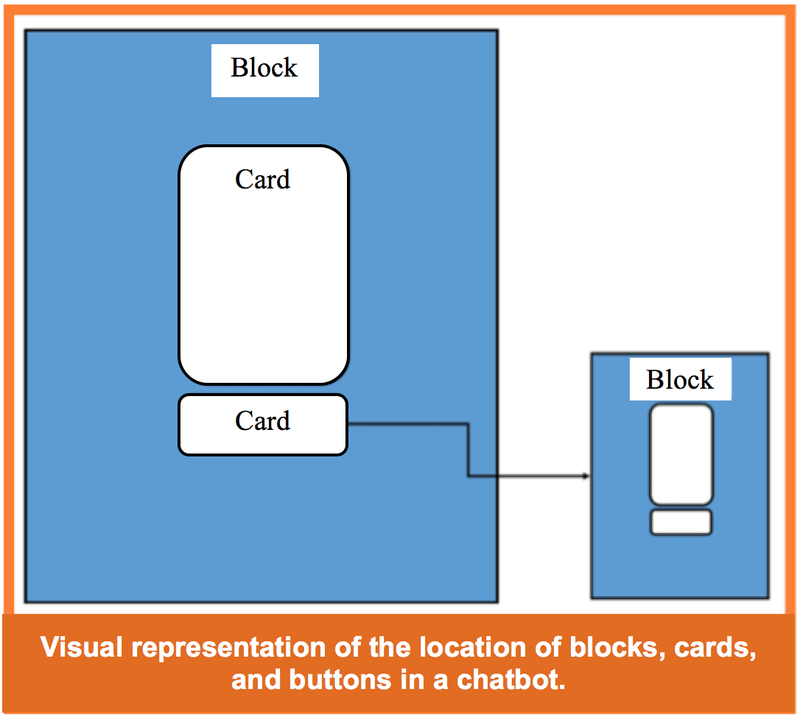 A block is made by one or more cards (in other words, messages). Several cards can be a part of the same block, which means, they can show as a single answer. You can also add a button to the inferior part of a card to provide the users a URL to clock or to open new answer blocks with more options. A text card has a space for text, buttons, and quick answers. 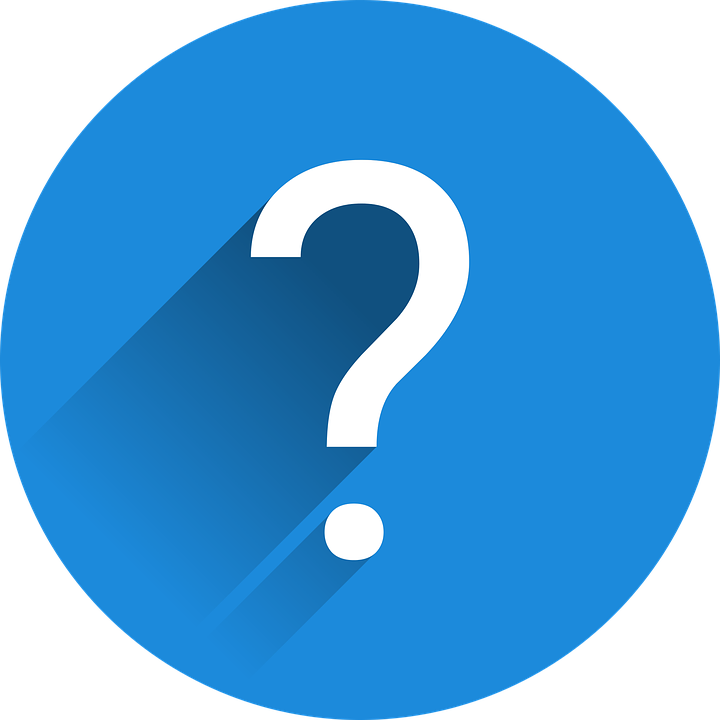 A card gallery can include numerous images in a carousel, each one of them with a title, subtitle, URL, and buttons, or a quick answer. A quick answer is an extra card that provides information about how to proceed in the instruction sequence, in case that the user does not know what to do next. An image card can include an image and a quick answer. A “plugin” card includes integrated options like offering the people the possibility of subscribing to your blog via RSS, send a post from one of your social networks through tools like IFTTT and plenty of other options. 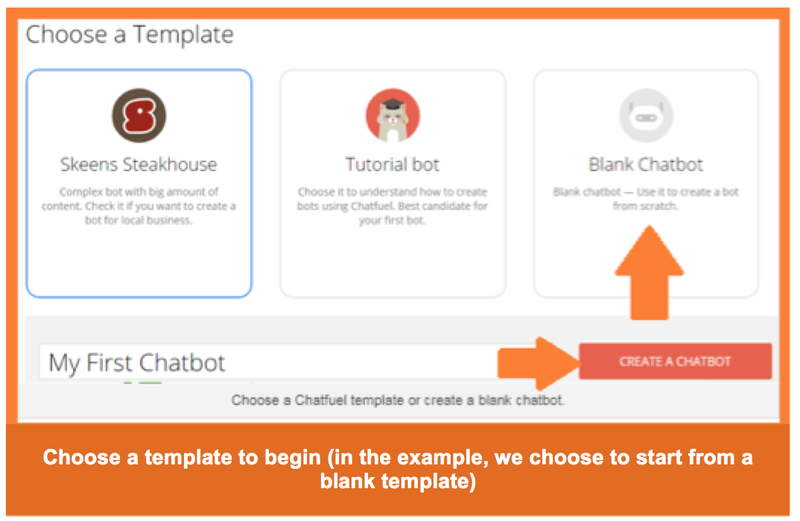 Step 2: Then, you must choose a template to edit, or create a chatbot from scratch (in this guide, we choose the latter). Input a name for the chatbot in the textbox and click on “Create a Chatbot” to create it. Step 3: Click on “Connect to Facebook” to connect it to your Fan Page. Step 4: Choose an existing Facebook Page (the one from your business), or create a Fan Page in which you desire to install the chatbot. 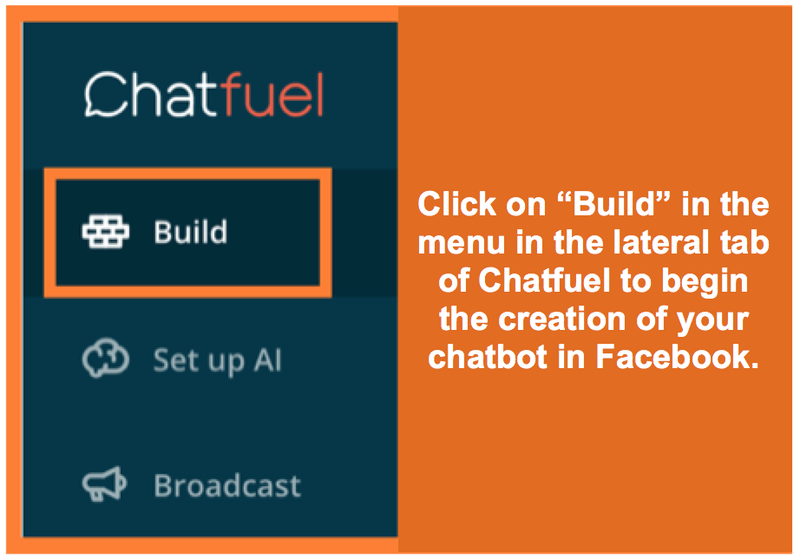 Step 5: Click on “Build” in the menu in the lateral tab in Chatfuel to begin to build your chatbot in Facebook. 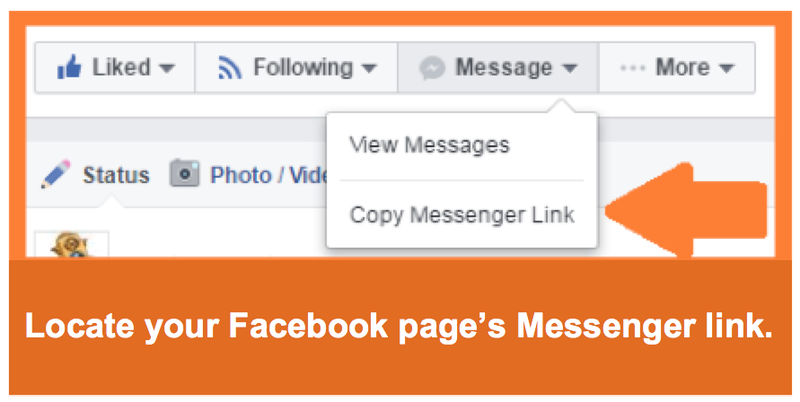 Step 6: The welcoming message is by default a text card, and it is the first thing the people will see after pressing the Messenger button from your Fan Page. You can leave this text card, add another one (for example, an image card), or opt for other choices like Plugin or a card gallery. Step 7: Input the corresponding components of the card you have chosen. You can also add buttons to the card for the users to click and do some determined option, like visiting a website, open a new block or make a phone call. Paso 8: The default answer is the block that shows in the button of the main menu in the start. 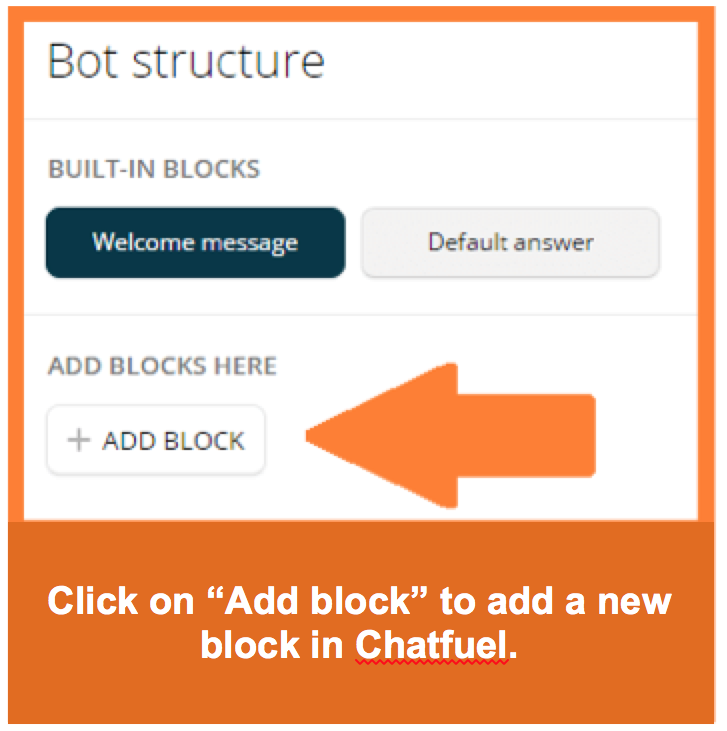 Chatfuel allows you to modify the message (that will be the first answer to appear when the user asks something). You can change the text or create a custom block to replace this default answer. Step 9: Keep in mind that you can add more than one button on this card. This way, if whatever your followers ask more often are your business’ schedules or its location, you can create additional blocks with that information to show it to the users. To create a new block, click on the “+ Add Block” button. Step 10: Upon clicking, a new window will pop up so you can create new card and buttons from scratch, to guide the users to new options. 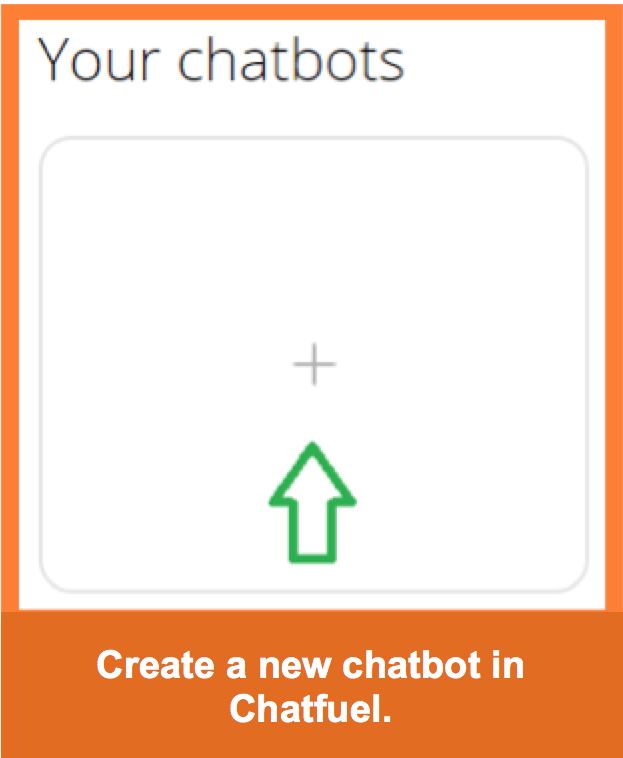 Step 11: When you are satisfied with your chatbot, click on “Test This Chatbot” to save the changes. Paso 12: Click on “View on Messenger” to test your chatbot. Step 13: It is recommended that you test the chatbot from tablets, smartphones, and other computers. 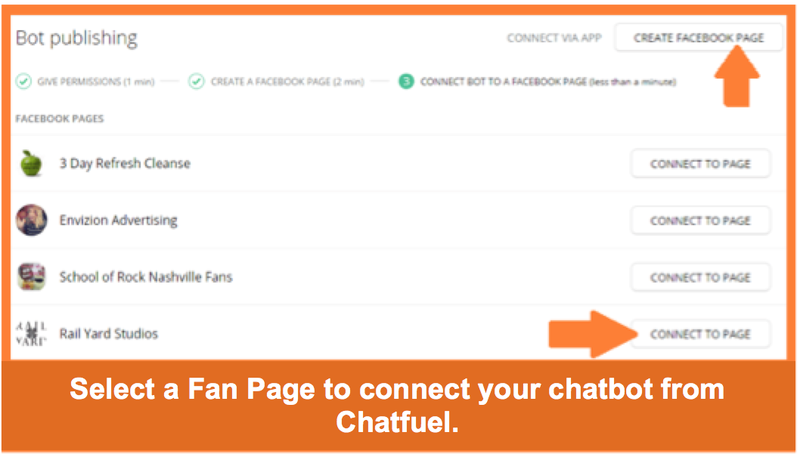 If something does not work as you expected, click on the help button in Chatfuel located in the lower-right corner or contact the company to get assistance. Second stage: guide the users towards your chatbot. 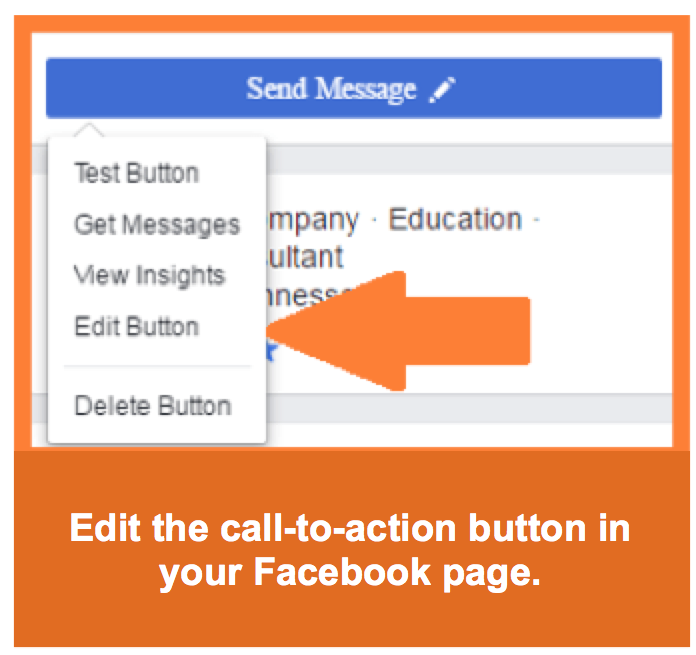 Step 1: Once your chatbot is ready and you have tested it, you must modify the blue call-to-action button that is available in your Facebook Page, just under the Cover. 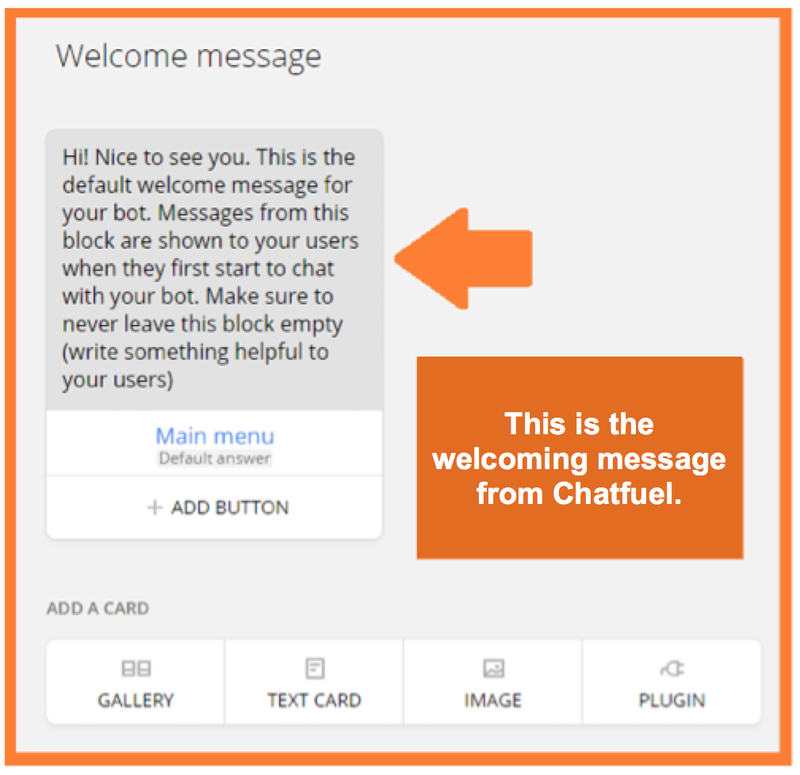 Replace the text with “Send Message” to invite the people to start a dialogue with your chatbot. 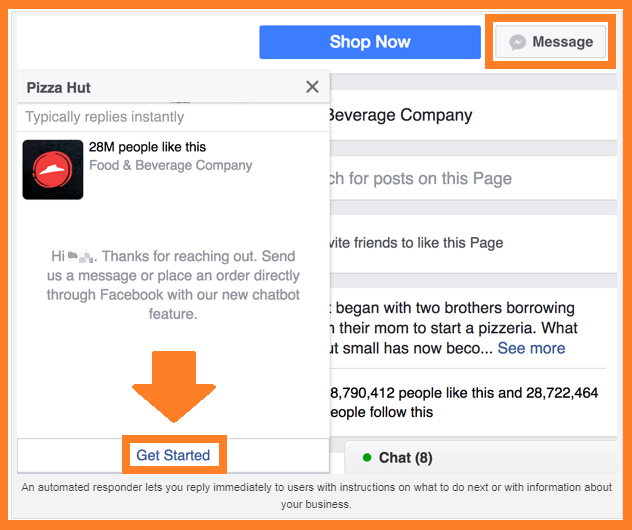 Step 2: You can also direct towards your chatbot your Facebook payment ads by copying your page’s Messenger URL. Step 3 (optional): At last, we advise you to install a Messenger plugin in your website to guide the visitors to start a dialogue with your chatbot on Facebook. That is it! As you may have noticed, the process is not complicated and, the growth possibilities that it provides your business are infinite. Apply it and tell us about it later! In conclusion, we can say that implementing a chatbot on Facebook for your business is the best way to capitalize at max your Facebook Page and ensure the loyalty of your clients at the same time. This way, and according to the configuration you establish, you can multiply your sales, answer doubts, promote your content, and more. This is all for today. Did you like this article-guide? Did you already know about the chatbots on Facebook? Tell us your opinion! And please, remember to share this blog post with your contacts. See you soon!